﻿ Fun Easy English - Environment - Global warming - Climate change Impacts on Agriculture and Food Supply. Agriculture is an important sector of the U.S. economy. The crops, livestock, and seafood produced in the United States contribute more than $300 billion to the economy each year. When food-service and other agriculture-related industries are included, the agricultural and food sectors contribute more than $750 billion to the gross domestic product. Agriculture and fisheries are highly dependent on the climate. Increases in temperature and carbon dioxide (CO2) can increase some crop yields in some places. But to realize these benefits, nutrient levels, soil moisture, water availability, and other conditions must also be met. Changes in the frequency and severity of droughts and floods could pose challenges for farmers and ranchers and threaten food safety. Meanwhile, warmer water temperatures are likely to cause the habitat ranges of many fish and shellfish species to shift, which could disrupt ecosystems. Overall, climate change could make it more difficult to grow crops, raise animals, and catch fish in the same ways and same places as we have done in the past. The effects of climate change also need to be considered along with other evolving factors that affect agricultural production, such as changes in farming practices and technology. Crops grown in the United States are critical for the food supply here and around the world. U.S. farms supply nearly 25% of all grains (such as wheat, corn, and rice) on the global market. Changes in temperature, atmospheric carbon dioxide (CO2), and the frequency and intensity of extreme weather could have significant impacts on crop yields. For any particular crop, the effect of increased temperature will depend on the crop's optimal temperature for growth and reproduction. In some areas, warming may benefit the types of crops that are typically planted there, or allow farmers to shift to crops that are currently grown in warmer areas. Conversely, if the higher temperature exceeds a crop's optimum temperature, yields will decline. Higher CO2 levels can affect crop yields. Some laboratory experiments suggest that elevated CO2 levels can increase plant growth. However, other factors, such as changing temperatures, ozone, and water and nutrient constraints, may counteract these potential increases in yield. For example, if temperature exceeds a crop's optimal level, if sufficient water and nutrients are not available, yield increases may be reduced or reversed. Elevated CO2 has been associated with reduced protein and nitrogen content in alfalfa and soybean plants, resulting in a loss of quality. Reduced grain and forage quality can reduce the ability of pasture and rangeland to support grazing livestock. More extreme temperature and precipitation can prevent crops from growing. Extreme events, especially floods and droughts, can harm crops and reduce yields. For example, in 2010 and 2012, high nighttime temperatures affected corn yields across the U.S. Corn Belt, and premature budding due to a warm winter caused $220 million in losses of Michigan cherries in 2012. Dealing with drought could become a challenge in areas where rising summer temperatures cause soils to become drier. Although increased irrigation might be possible in some places, in other places water supplies may also be reduced, leaving less water available for irrigation when more is needed. Many weeds, pests, and fungi thrive under warmer temperatures, wetter climates, and increased CO2 levels. Currently, U.S. farmers spend more than $11 billion per year to fight weeds, which compete with crops for light, water, and nutrients. The ranges and distribution of weeds and pests are likely to increase with climate change. This could cause new problems for farmers' crops previously unexposed to these species. Though rising CO2 can stimulate plant growth, it also reduces the nutritional value of most food crops. Rising levels of atmospheric carbon dioxide reduce the concentrations of protein and essential minerals in most plant species, including wheat, soybeans, and rice. This direct effect of rising CO2 on the nutritional value of crops represents a potential threat to human health. Human health is also threatened by increased pesticide use due to increased pest pressures and reductions in the efficacy of pesticides. Americans consume more than 36 million metric tons of meat and poultry annually. Livestock and poultry account for over half of U.S. agricultural cash receipts, often over $100 billion per year. Changes in climate could affect animals both directly and indirectly. Heat waves, which are projected to increase under climate change, could directly threaten livestock. In 2011, exposure to high temperature events caused over $1 billion in heat-related losses to agricultural producers. Heat stress affects animals both directly and indirectly. Over time, heat stress can increase vulnerability to disease, reduce fertility, and reduce milk production. Drought may threaten pasture and feed supplies. Drought reduces the amount of quality forage available to grazing livestock. Some areas could experience longer, more intense droughts, resulting from higher summer temperatures and reduced precipitation. For animals that rely on grain, changes in crop production due to drought could also become a problem. Climate change may increase the prevalence of parasites and diseases that affect livestock. The earlier onset of spring and warmer winters could allow some parasites and pathogens to survive more easily. In areas with increased rainfall, moisture-reliant pathogens could thrive. Potential changes in veterinary practices, including an increase in the use of parasiticides and other animal health treatments, are likely to be adopted to maintain livestock health in response to climate-induced changes in pests, parasites, and microbes. This could increase the risk of pesticides entering the food chain or lead to evolution of pesticide resistance, with subsequent implications for the safety, distribution, and consumption of livestock and aquaculture products. Increases in carbon dioxide (CO2) may increase the productivity of pastures, but may also decrease their quality. Increases in atmospheric CO2 can increase the productivity of plants on which livestock feed. However, the quality of some of the forage found in pasturelands decreases with higher CO2. As a result, cattle would need to eat more to get the same nutritional benefits. American fishermen catch or harvest five million metric tons of fish and shellfish each year. U.S. fisheries contribute more than $1.55 billion to the economy annually (as of 2012). Many fisheries already face multiple stresses, including overfishing and water pollution. Climate change may worsen these stresses. In particular, temperature changes could lead to significant impacts. Picture - This map shows the annual centers of biomass for three species in the northeastern United States from 1968 to 2015. Dots are shaded from light to dark to show change over time. Source: US EPA (2016). Climate Change Indicators in the United States: Marine Species Distribution. Data Source: NOAA (2016). The ranges of many fish and shellfish species may change. In waters off the northeastern United States, several economically important species have shifted northward since the late 1960s. 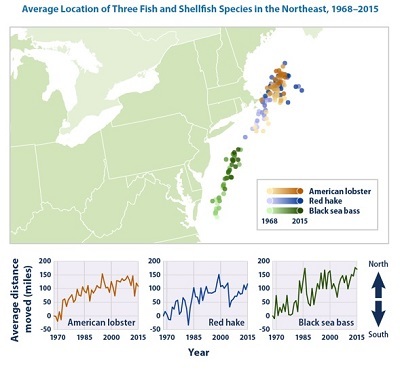 The three species shown in [the figure to the left] (American lobster, red hake, and black sea bass) have moved northward by an average of 119 miles. Many aquatic species can find colder areas of streams and lakes or move north along the coast or in the ocean. Nevertheless, moving into new areas may put these species into competition with other species over food and other resources, as explained on the Ecosystems Impacts page. Some marine disease outbreaks have been linked with changing climate. Higher water temperatures and higher estuarine salinities have enabled an oyster parasite to spread farther north along the Atlantic coast. Winter warming in the Arctic is contributing to salmon diseases in the Bering Sea and a resulting reduction in the Yukon Chinook Salmon, Finally, warmer temperatures have caused disease outbreaks in coral, eelgrass, and abalone. Changes in temperature and seasons can affect the timing of reproduction and migration. Many steps within an aquatic animal's lifecycle are controlled by temperature and the changing of the seasons. For example, in the Northwest warmer water temperatures may affect the lifecycle of salmon and increase the likelihood of disease. Combined with other climate impacts, these effects are projected to lead to large declines in salmon populations. In addition to warming, the world's oceans are gradually becoming more acidic due to increases in atmospheric carbon dioxide (CO2). Increasing acidity could harm shellfish by weakening their shells, which are created by removing calcium from seawater. 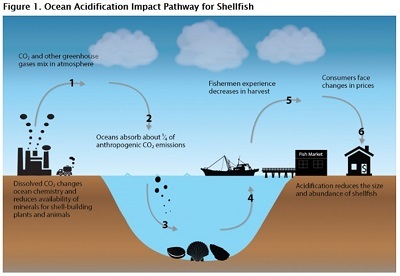 Acidification also threatens the structures of sensitive ecosystems upon which some fish and shellfish rely. Climate change is very likely to affect food security at the global, regional, and local level. Climate change can disrupt food availability, reduce access to food, and affect food quality. 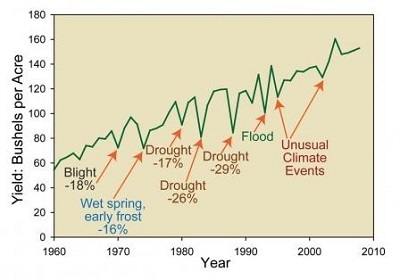 For example, projected increases in temperatures, changes in precipitation patterns, changes in extreme weather events, and reductions in water availability may all result in reduced agricultural productivity. Increases in the frequency and severity extreme weather events can also interrupt food delivery, and resulting spikes in food prices after extreme events are expected to be more frequent in the future. Increasing temperatures can contribute to spoilage and contamination. Internationally, these effects of climate change on agriculture and food supply are likely to be similar to those seen in the United States. However, other stressors such as population growth may magnify the effects of climate change on food security. In developing countries, adaptation options like changes in crop-management or ranching practices, or improvements to irrigation are more limited than in the United States and other industrialized nations. Any climate-related disturbance to food distribution and transport, internationally or domestically, may have significant impacts not only on safety and quality but also on food access. For example, the food transportation system in the United States frequently moves large volumes of grain by water. In the case of an extreme weather event affecting a waterway, there are few, if any, alternate pathways for transport. High temperatures and a shortage of rain in the summer of 2012 led to one of the most severe summer droughts the nation has seen and posed serious impacts to the Mississippi River watershed, a major transcontinental shipping route for Midwestern agriculture. This drought resulted in significant food and economic losses due to reductions in barge traffic, the volume of goods carried, and the number of Americans employed by the tugboat industry. The 2012 drought was immediately followed by flooding throughout the Mississippi in the spring of 2013, which also resulted in disruptions of barge traffic and food transport. Transportation changes such as these reduce the ability of farmers to export their grains to international markets, and can affect global food prices. Impacts to the global food supply concern the United States because food shortages can cause humanitarian crises and national security concerns. They also can increase domestic food prices. Moderate warming and more carbon dioxide in the atmosphere may help some plants to grow faster. However, more severe warming, floods, and drought may reduce yields. Livestock may be at risk, both directly from heat stress and indirectly from reduced quality of their food supply. Fisheries will be affected by changes in water temperature that make waters more hospitable to invasive species and shift the ranges or lifecycle timing of certain fish species.